If the test is “completely meaningless,” why does it have “some” predictive power? It can’t be both. 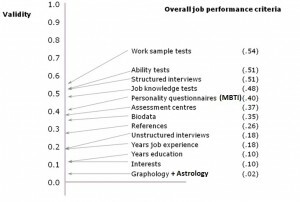 It is true that the MBTI has little predictive power with regards to happiness in marriage or job performance, but the MBTI doesn’t claim to measure those things, so why should that be a problem? It is true that some people think that, but there is no basis for claiming that “most” of the people who are sympathetic to the MBTI think that it can meaningfully determine which careers you will thrive in. Some people also think that microwave ovens can be used to dry their pets, but that doesn’t really reflect badly on microwave ovens. Jung’s theories weren’t out-dated in the 1940s; on the contrary, the Allies used him as an intelligence agent, crafting psychological reports on Hitler, which were read by Eisenhower, among others. Also the matter of Jung’s relation to mainstream psychology is not as black and white as the writer lets on. More about that later. 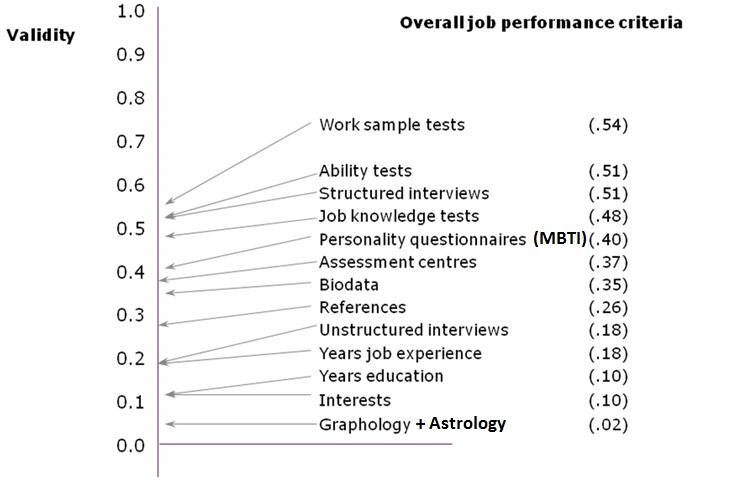 It is true that the test is ineffective at predicting job performance, but again, the MBTI itself says that it should not be used to determine job performance, so the MBTI is like a microwave with a big yellow warning sticker that says: “WARNING – SHOULD NOT BE USED TO DRY PETS,” but which nevertheless attracts scores of detractors who voice their offense at the fact that the microwave isn’t a suitable way of drying your pet. Not brain – psyche. Anachronisms are unseemly. It was important to Jung that his theories were not materialistic or Aristotelian, which is why he avoided giving them a physiological basis. This is not correct. Judging and Perceiving are Myers’ and Briggs’ inventions, based only loosely on Jung’s original concepts of rational and irrational. If you are going to report on the contents of a book, do yourself the trouble of reading it. Neither Darwin’s theory of evolution nor Einstein’s theory of relativity came out of “controlled experiments or data.” Like Jung’s theory of types, they were initially made up and later confirmed to some degree by experiments. In the same way, Jung’s theory of the elements that constitute the personality have also been confirmed to some degree by later experiments. It seems disingenuous not to inform the reader that the basic gist of Jung’s postulates have been confirmed in experiments to some degree. Myers and Briggs were not psychologists, but they nevertheless succeeded in doing what academically certified people in their own time failed to do. If someone runs a marathon and finishes ahead of the pros, should he then be stripped of his victory because he isn’t a professional runner? This is factually incorrect. The writer is confusing the official MBTI material with fan-generated material that he has found online. If a Richard Dawkins fan believes in astrology, does that constitute a sound basis for claiming that Richard Dawkins believes in astrology? The logic seems to be limping here. Actually, the two areas of Jung’s theories that are widely regarded as being non-mystical and compatible with empirical science are his studies in word association and his theory of types. It seems disingenuous not to inform the reader of this. This point will be dealt with in conjunction with point #15 below. It doesn’t seem like the writer has any sources for his claim that “psychologists” are of this opinion, and Adam Grant’s assertion is incorrect. Grant hasn’t done even the most basic research on the MBTI and mistakenly thinks that the MBTI’s “Feeling” category is about actual feelings. But the very first hit on Google for “MBTI thinking feeling” takes you to the official Myers & Briggs Foundation and tells you that it is not. Again, we must urge journalists not to use Grant as a serious source. The fact that Grant misconstrues scientific source material to make his point should be a huge disqualifier in and of itself. Grant is basically someone with a fancy academic title who keeps insisting that microwaves should be able to dry pets. This point seems like a non sequitur. The MBTI doesn’t purport to measure any kind of psychopathology, so why should clinical psychologists use it? On the other hand, it is easy to find organizational psychologists who use it. Also, one might get the idea from the article that the very practice of testing static personality “traits” is on the retreat. The state of the art in personality testing is still the Big Five test and so the practice of measuring personality in static terms rather than fluid ones is not at all on the retreat. Again, the writer is confusing the official MBTI material with the fan-generated material found online. But disregarding that, it is generally true that the MBTI has a positive bias. We have dealt with that criticism here. Yes, the MBTI is generally too positive, but one reason for the positivity was that it was developed to be used in organizations where the practitioners had to get people to accept their results. The Big Five was developed to be used by researchers and did not need to win the acceptance of the test takers. Now that psychologists are seeking to use the Big Five in organizations, they have found it necessary to adopt a positive bias which is akin to the one used in the MBTI, and even to postulate personality types, which is one of the things that the adherents of the Big Five started out criticizing the MBTI for. The process can be compared to a child who criticizes his parents for the slights in their parenting. The child vows to himself that when he grows up and becomes a parent, his parenting will be much better. But then, when he actually is a parent, and stands there with the crying children, he finds himself repeating many of the “mistakes” that his own parents made. Additionally, if people want negative type descriptions, they need to look no further than Jung’s Psychological Types. Since the writer has ostensibly read that book (see point #6 above), it seems like an oversight that he doesn’t mention these non-positive type descriptions to his readers. This criticism is true, as we have examined here. It is the single biggest problem with the MBTI. 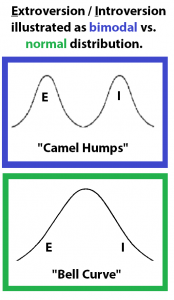 The writer seems to be saying that the scales measured by the MBTI are normally distributed, while the scales measured by the Big Five are bi-modally distributed. In reality, both the scales measured by the MBTI and the scales measured by the Big Five are normally, rather than bi-modally, distributed. The writer says that apart from the E/I dimension, the other dimensions of the Big Five are entirely different from the MBTI. But in fact, Sensation-Intuition on the MBTI is related to the Big Five’s concept of Openness, Thinking-Feeling on the MBTI is related to the Big Five’s concept of Agreeableness, and Judging-Perceiving on the MBTI is related to the Big Five conception of Conscientiousness. 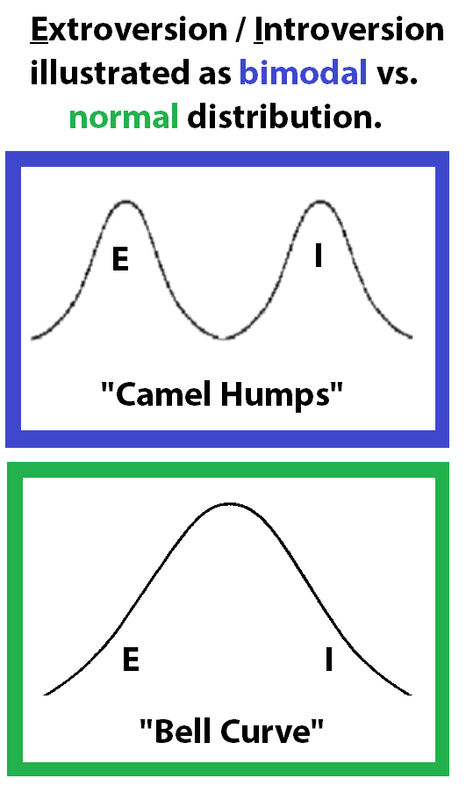 While there are differences in overall methodology (the MBTI is Platonic, while the Big Five is Aristotelian), the basic gist of the four dimensions mentioned above is the same. Ironically, the people who fault Jung for just making up the scales tend to be oblivious to the fact that modern science has largely ended up confirming the scales he came up with. The criticism is like faulting Darwin for only having had a vague idea of evolution without being able to work out the genealogy of every species in detail. According to that manner of measuring results, Darwin should actually be criticized for postulating a theory that was largely right, because he didn’t have all the details back in 1859. Later scientists, who then confirmed his theory in the lab using data, should then snub their noses at Darwin and claim exclusive credit for the theory of evolution. So apparently a test which has been demonstrated to measure actual elements of the personality to an acceptable degree is no better than a test which has no validity to back it up. It seems a bit hasty on Stromberg’s part to say that because something is somewhere in the middle of the road in its field, then it’s no better than something at the very bottom. This is somewhat like saying that because silver isn’t gold, then silver is really worthless. It seems that Stromberg is overstating his case at the end. The MBTI has known issues and has had so for years. But the MBTI has never been found to be devoid of validity, as the writer insinuates, or to be “totally meaningless” as the writer’s headline says. As mentioned, we agree with the point that there are problems regarding the pricing and certification process that surrounds the official use of the MBTI instrument. But how does Stromberg know that certified MBTI practitioners are “cheerleaders” for the MBTI? One of the authors of this article was first typed by a certified psychologist and MBTI practitioner who introduced the instrument by saying that she didn’t see the value of it. It seems that Stromberg is presuming to know the motives of thousands of people without having anything solid to base his claims on. Didn’t he just say that it was important to base your claims on data? It is really tiresome that writers who set out to criticize the MBTI can’t be bothered to acquaint themselves with the most basic facts concerning the instrument. As we covered on the site long ago, almost every scientific study ever conducted has concluded that there is some validity to the MBTI, while there is no validity to astrology. Hence there is really no basis at all for claiming that their validity is “about the same” and it is an incontrovertible mistake on the writer’s part to suggest otherwise. I would like to point out that Jung did not simply make up the types out of nowhere nor even without experimental evidence. Part of the source for the types came out of the word association experiments done at the Burgholzli clinic. Jung inferred that the different types of responses related to different functional types: sensation types tended toward clang associations,intuitive types to semantic associations, etc. The type designations developed later but Jung discusses in several places that the original notion of the psychological functions came from these experiments, which were cutting edge psychological science at the time, from one of the most prestigious psychiatric clinics in the world. It is also disingenuous of Stromberg to ignore the fact that the Big Five and the Eysenck models are both descendants of Jung’s original types, even though they different in many ways. You are actually wrong. Myers Briggs is totally worthless. As a research psychologist with a PhD in Behaviour Social Psychology, and somebody with experience in Myers Briggs. I can tell you, you are wrong. Myers Briggs is totally worthless. Please link us to your research/scholar page. We’re eager to learn more from such a distinguished party. Also, what studies have shown the MBTI to be “totally worthless”? Those links would be great to have as well. Very good article, unlike the few badly researched articles that pretend to debunk MBTI. It’s appalling when the only thing some “distinguishable” psychologist can say, is “we’re authority, we say MBTI is hogwash and you should believe us”, without even explaining what they are debunking, the theory, the cognitive functions? or the test itself? As if with any other theory, we’re aware that MBTI is a simplified model of reality, it’s not reality itself. Instead of attacking the whole idea of typology, i hope these researchers can do something better than to label all xNxPx as ADHD for example. Martin Fry is wrong. Myers Briggs is very useful and helpful if used correctly by qualified practitioners. As a (D level) Chartered Occupational Psychologist, registered Coaching Psychologist and Qualified Occupational Tester and someone not only with experience of MBTI but also who has been trained in its use and owns the research manual behind it, I can tell you your article is excellent. Myers Briggs is very, very useful.